Widows Support group meet weekly, at the Bellvue Cafe on Mondays 9.30am; please see below for further details. 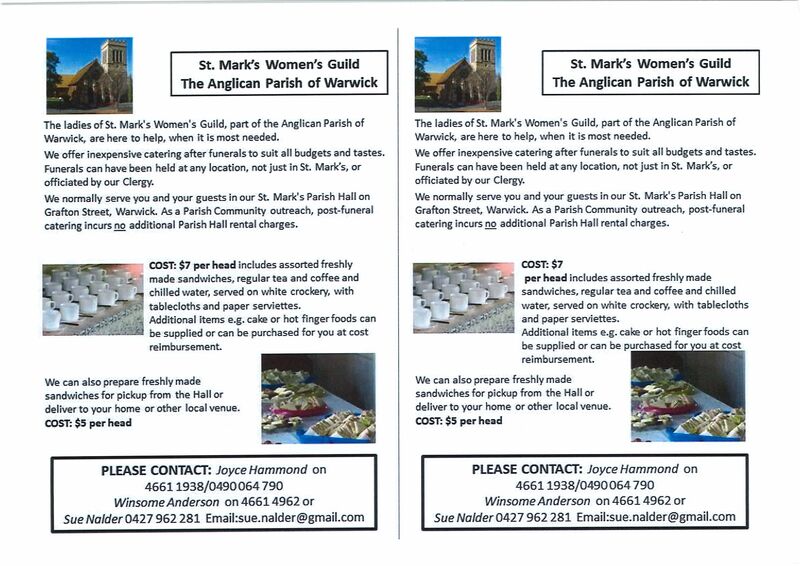 St Marks Guild meet monthly on the 4th Monday, at 9.30am; (no meetings in December/January). Friends of St Marks meet monthly on the 3rd Monday at 9am. Mothers Union St Marks meet monthly on the 2nd Monday at 10am. Craft Group meet in the Resource Room, Thursdays 1.30 - 3pm. No meetings between mid December - mid January. Sunday School meet Sunday 8.30am Service at St. Mark's Church (school term only). Has fourteen (14) members who are enthusiastic to join in the Fellowship and to contribute to the betterment of our Church. Our group continues to be a supporting one, offering friendship and fellowship to those who need and enjoy it. We are a friendly and caring group. We continue to gather together each Monday morning at the BelleVue Café for morning tea, where Mark and his team look after us wonderfully with a delicious range of homemade goodies to tempt us. While the official gathering time is 9.30am, it is a case of get there when you can, whether it is earlier or later. We can at times be a noisy bunch, but a happy one, and if anyone needs some extra support we are there to assist or comfort. There is no cost to coming along or to be involved, except to pay for your own morning tea. Any single lady can come along and join us whether you are a widow or not. When you are on your own, it is great to be able to join in a group where you are welcome and the friendship mat is rolled out. We are non-denominational and are there to hold out a comforting hand or shoulder and to offer friendship and fellowship. If you would like to come along and join in or if you know someone who could benefit by having a ‘cuppa’ and a chat with a friendly and caring group of ladies (or girls as we refer to ourselves), just come along on a Monday morning and you will be made very welcome or you can contact Glenna on 4661 3300 for more information. The purpose of Mother’s Union is to be especially concerned with all that strengthens and preserves marriage and Christian family life. Mothers Union (MU) holds other special meeting days, Pancake Day, Mothering Sunday, Wave of Prayer and our members attend Deanery Days at other branches in our Deanery. St. Mark’s MU turned 110 in September 2017. Friend’s is a group of women who raise funds for various requirements in and around St. Mark’s. We are a friendly, happy group of women who enjoy one another’s company whilst working with the group and others to set and achieve our community's outcomes. All are welcome to join. Special projects may be undertaken to donate to foster children, disadvantaged children, the homeless and seamen. Donations of wool and other craft supplies have been gratefully accepted and utilised. We warmly welcome more people to join our craft group. Sunday School has recommenced in 2018. A committed group of people are now offering a place where children can be nourished in faith through stories and activities that give them a basic understanding of what it is to be a baptised Christian and a beloved child of God. Clare McHugh von Stieglitz, Co-ordinator on 4661 3886 or simply come along to the 8.30am Sunday Service at St. Mark's. As you can see, members of our Parish community give so generously in many ways. 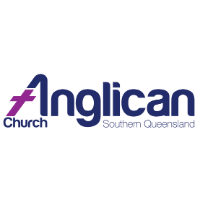 Whether it be on the Worship Roster, to be a Leader - Server - Sidespersons - Sound - Intercessor - Reader - Morning Tea, or caring for the Church and Grounds on the cleaning roster and as Groundsperson. We are extremely appreciative of anyone's assistance.